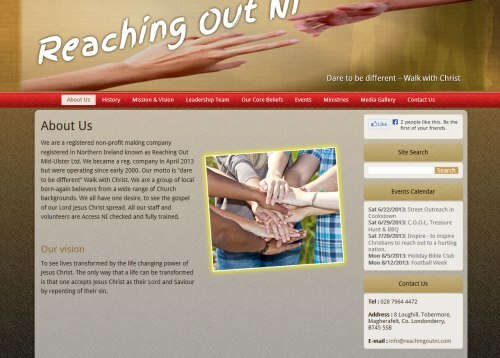 Reaching Out Mid Ulster is a non-profit making company with the motto “Dare to be different, Walk with Christ”. They provide facilities for youth and children’s bible events throughout Mid Ulster including street outreach helping young people in nightspot areas. The website allows the company to promote their beliefs and missions as well as providing an interactive calendar function so that they can update site visitors on upcoming events.